Lonard and Rosemary Daka have been church planting in this area of Zambia for about 25 years. As they developed churches they were swamped by the needs of the vulnerable children and their guardians. They started 'Chifundo' to care for the children, to resource and encourage the guardians, to get the children into school and assist the community. Sadly, Lonard passed away on 19th January 2015 after a battle with stomach illness. The partnership continues, but Lonard will be sorely missed. The Daka’s son, Steven, who was previously very involved, has now taken over the lead role in the partnership since Lonard's death. In 2003 Bright Hope World first visited this area of Zambia at the invitation of Lonard and Rosemary Daka. They had been known to Bright Hope World for many years and we observed their church planting programme. They worked very hard to establish a number of small rural churches in this area. Their conviction is that local churches would be the most effective agents of change in the community. 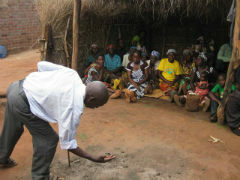 In the village from which they operate, Mchacha, there is now a church of over 130 members. This is a large percentage of the population of the village. As the impact of the HIV/AIDS pandemic moved with full force into the rural village, the church was not able to cope with the numbers of orphaned children. They did not have the resources to deal with the numbers or the degree of poverty. This is also a drought prone area although with the introduction of Foundations for Farming yields have shown significant increase. There are now 27 children and their guardian families in the Chifundo catchment area who directly benefit from this partnership through school fees, a higher education programme and farming programmes. There are many things Bright Hope World appreciates about this partnership. Lonard and Rosemary are well known to us and are well regarded in the community. Lonard was respected and the community leaders spoke very highly of him. They genuinely care for people. Steven Daka, along with his mother Rosemary, is now managing the partnership. 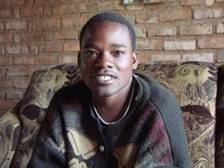 Steven has trained in accountancy and business and has his own business buying and selling goods from Malawi. Steven attended OM missionary training school in Kabwe in 2017. Steven and Rosemary will regularly visit with Norman Tonga (ZAM23) and discuss the issues they face in the partnership. Steven Daka and Norman Tonga form the executive team that oversee the daily operation of the Chifundo partnership. This team also oversees the Chipata Rural OVC’s (ZAM23) programme. Sending the children to school is the major component of this partnership. There are also small and irregular food and household supplements including blankets given from time to time to those in need. The leadership team have started agriculture training based on the "Foundations for Farming" system. They have been achieving very good results by discipling people to improve yields. Setting a fine example, Lonard was often seen bent over with his hands in the ground explaining farming principles. Steven is wanting to carry this training on at some stage in the future. School leavers can find it difficult in the area in regard to what to do next. The leaders are developing a programme to help fund and train school leavers in a variety of activities from shop keeping, farming to small scale manufacturing of goods. There are a total of 29 orphans who have completed Grade 12 and are in this programme. Vinya is one of the earliest children to join Chifundo programme and has been involved since 2001. 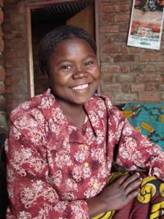 She has been helped with going to school and with books, blankets, soap and shoes. This has been a huge help. Vinya stays with her grandmother and has a sister, though she has never seen her. She goes to church with her grandmother at the local CMML church. She has a very clear Christian testimony and became a Christian when a child and is very clear that Jesus died for her and loves her. 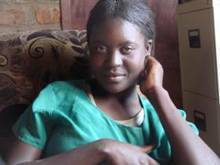 She goes with Gift Daka (Rosemary and Lonard's daughter) to teach the kids about Jesus and wants to be a teacher when she grows up. She also helps at home with cultivating, cleaning and cooking. Vinya is an outgoing girl and laughs a lot with her friend Gift. 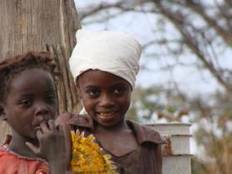 The orphan children often get laughed at by their peers and cop a lot of criticism because they do not have a family. Vinya is hurt by this and feels bad, but just stays quiet. There are many others like her in the community. Many girls do not go to school; in fact, there are only two her age at school.